WASHINGTON — Eleven months after the inauguration of President Donald Trump, trials have begun for the more than 160 people arrested during violent anti-Trump protests in Washington on Inauguration Day. The protesters are being tried in small batches in a process that is expected to extend deep into 2018. The first trial, which began Monday and is expected to continue for about a month, accuses the first batch of six protesters of inciting a riot and destruction of property — charges which could result in prison sentences of over 60 years. 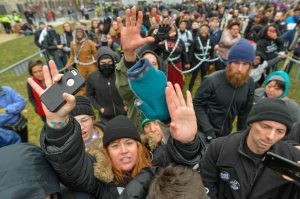 The charges stem from a violent Jan. 20 protest, in which hundreds of demonstrators dressed in black, many with their faces masked, marched downtown toward Franklin Square. Some marchers broke windows in a bank and a Starbucks, and a limousine parked on K Street across from Franklin Square was trashed and set ablaze. The prosecution is pursuing a somewhat unusual strategy: Rather than trying to prove that any of individual defendant was personally guilty of destruction, prosecutors are arguing that all demonstrators present that day were aware and supportive of the violent intentions of the others. Assistant U.S. Attorney Jennifer Kerkhoff, in her comments, has repeatedly referred to the “black bloc tactics” of the protesters as part of a message that everyone participating in the protest came with either the intention to commit violence or the knowledge that violence was part of the plan. It’s a strategy that defense attorneys have already labeled illegal collective punishment. And whether or not this approach succeeds for the first batch of defendants could heavily influence the prosecution’s strategy for the successive batches of defendants. Much of the evidence presented in the opening two days of the trial has relied heavily on a variety of videos — from police helicopters, security cameras and the defendants’ own social media posts. Witnesses so far have included police officers on the scene and the driver of the burned limousine.